Located in the Provence-Alpes-Côte d'Azur region, Nice is a city in southern France, on the Mediterranean Coast near the border with Italy. As of 2004, Nice had an estimated population of 347,100. Nice is a major tourist center, and one of the leading resorts on the French Riviera (French: Côte d'Azur). Nice is located in the Provence-Alpes-Côte d'Azur region of southern France, on the Mediterranean Coast near the border with Italy. As of 2004, Nice had an estimated population of 347,100. People from Nice are known as Niçois. 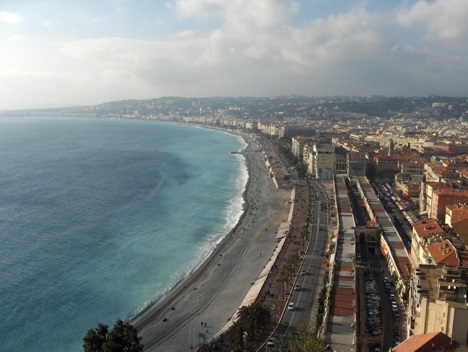 Nice is believed to have been founded by the Greeks of Marseille in around 350 BCE. Their settlement was named Nikaia, after Nike, the goddess of victory. Nice is one of the main resorts on the French Riviera (French: Côte d'Azur), and is very popular with tourists and vacationers. Nice is often called "Nice la Belle" (Nice the Beautiful). This is also the name of the unofficial anthem of the city, which was written by Menica Rondelly in 1912. The famous beachfront in Nice is known as the Promenade des Anglais (Promenade of the English), often simply known La Promenade or La Prom. The most famous hotel in Nice, is the Hotel Negresco. 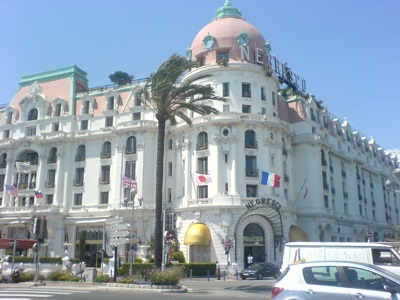 Hotel Negresco is palatial hotel on the the Promenade des Anglais. The Hotel Negresco first opened in 1913, and contains a gourmet dining (two stars in Guide Michelin) restaurant called Le Chantecler. In 2003, Hotel Negresco was designated by the French government as a national historic building. The annual Nice Carnival, which spans the two weeks prior to Mardi Gras (Fat Tuesday), takes place on the Promenade des Anglais. The carnival attracts around 1 million visitors each year. Nice has a Mediterranean climate. Winters are mild, and Summers are generally hot, dry, and sunny. Rainfall most falls during the Winter, and in the Summer is much less frequent - typically there are only one of two days of measurable rain in July for example.